SKU: N/A. Category: Classroom Training. 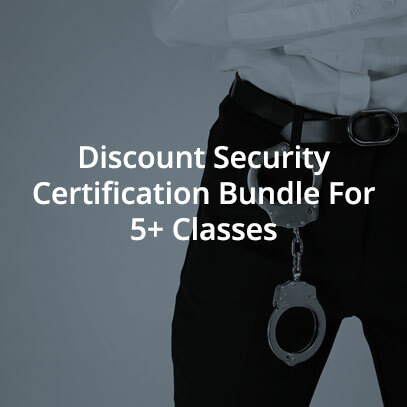 DISCOUNT SECURITY CERTIFICATION BUNDLES AVAILABLE! TAKE 5, OR 8 CLASSES & GET HUGE DISCOUNTS! SPECIAL OFFER – CELEBRATING 10 YEARS!!! Buy an 8 class package for only $500, get all our great training at this deep discount – classes cost $875 if purchased separately, buy this package and save a whopping $375 (43%) off the list price! (List price for these classes is between $100 and $150 each). Take advantage of our offer for discount classes. When you buy classes in bulk we will give you a percentage off, so the more you want to learn – the more you will be rewarded! Purchase a couple for yourself and give a few classes to a loved one. After purchasing the bundle, go to the “upcoming courses” link on the site and select your desired courses. After the courses are selected, then email the owner ljbsectraining-consulting@yahoo.com. If you want the ones you care about to learn self defense and security, this is the perfect opportunity at a discounted rate. Learn these classes and refuse to be the victim. By having a knowledge of self defense, you will have all of the tools you need to have your own safety strategy when faced with a dangerous situation.In addition you will be much more prepared for a career in law enforcement if that is your intent. The way the program is designed is that the package enables you to take and finish all the classes within 4 weeks of your start date or take up to 6 months. So if you are busy you may take up to 6 months to finish your package. Just remember you only have 6 months to complete all the classes in the package.